We’ve compiled a list of our favorite destination elopement packages for any bride and groom to view. No matter, if you are from the United States or abroad our wedding coordinators, can help you plan the perfect day… right down to a package including a cute champagne toast and a wedding cake! 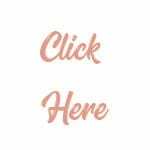 We invite you to check out our elopement package locations! Red and white sandstone cliffs paint a memorable picture with photographs that capture each precious moment. Ash Springs at Red Rock Canyon is included as one of our fine Las Vegas Elopement Packages. Cottonwood and velvet ash trees with salt grass meadows are just a few of nature’s desert fineness located in Red Springs at Red Rock Canyon. 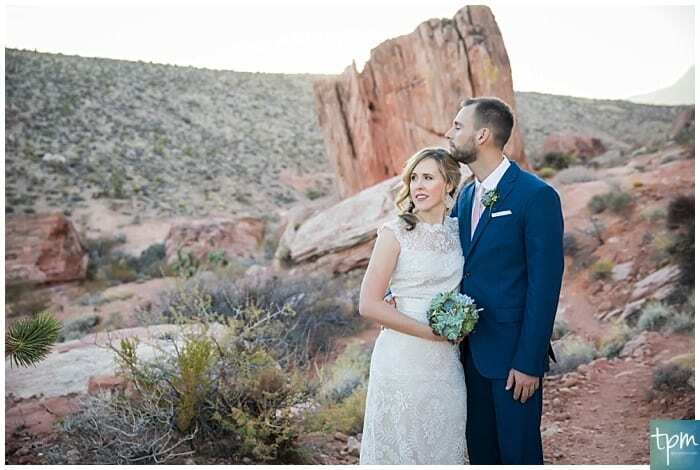 Our wedding coordinator will help couples seeking to elope in a secluded, quiet spot at the Calico Basin will be taken in by its breathtaking beauty and long rustic boardwalk that beckons them on a wedded journey. Views of the grand rock cliffs and the surrounding countryside are perfect at every angle. Tying the knot at Red Springs beats an Elvis wedding every time. Nothing else can compete with Nevada’s desert landscape. Just a few miles west of the bright lights of Las Vegas, the world turns into a magnificent landscape called Red Rock Canyon. Its incredibly huge rock formations and vivid red colors captivate any couple who dreams of tying the knot there. Dinosaurs roamed the area millions of years ago, and Red Rock Canyon Overlook is one of our superb Destination Elopement Packages. Couples looking for a romantic escapade will find it in the stunning sunsets and panoramic views. 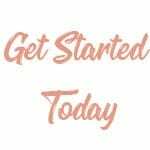 Our Las Vegas Officiant is part of our Las Vegas Elopement Packages All Inclusive and delivers what each couple desires in their personal ceremony. It’s no surprise that the Mojave Desert is home to flowers and trees that offer incredible texture, form and color. Cactus Joe’s Las Vegas Nursery welcomes guests with its abundant botanical beauty, the cutest little wedding chapel in town and room for an outdoor reception. 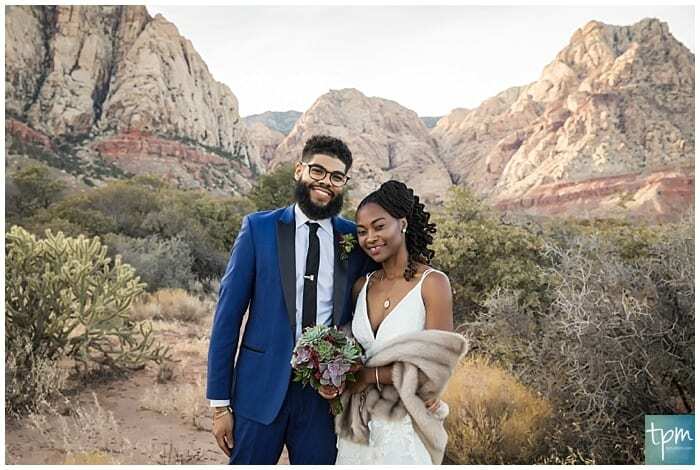 Couples tying the knot who dream of a Vegas Wedding without the glitz of the strip appreciate the quieter landscape for perfect photos. This magical desert garden lined with Joshua trees and exotic cacti is nestled between Red Rock Canyon and Blue Diamond. Calico Basin is located at the base of spectacular Red Rock Canyon and only about 35 minutes west of the strip. The picturesque area is home to the Bonnie Springs Ranch and its quaint Old West theme. 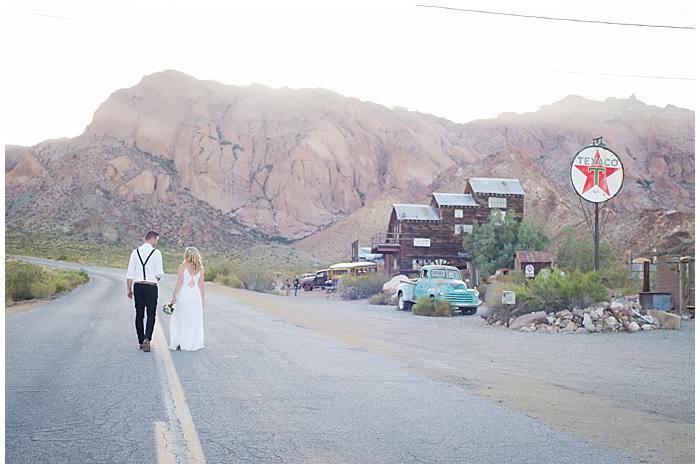 We proudly include Bonnie Springs as one of our Las Vegas Elopement Packages All Inclusive. 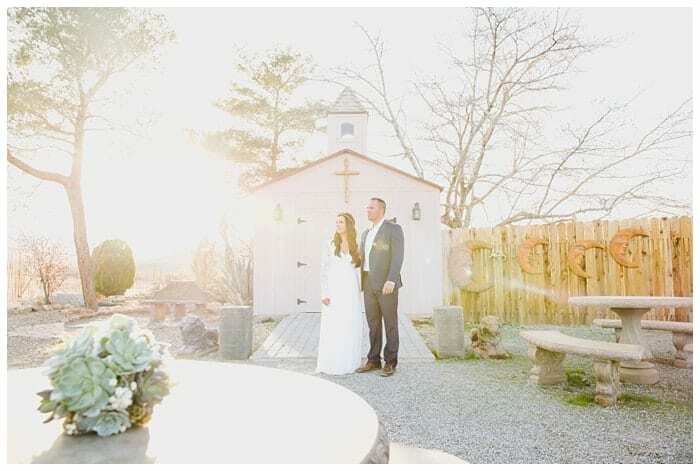 Couples fall in love with the small wedding chapel decorated in rustic pine and a great saloon on the property. This oasis offers unique activities for the couple planning their nuptials. The ranch features train rides, horseback riding and a zoo. The lake bed is located south of Las Vegas near Boulder City and offers couples seclusion despite its huge flat landscape. 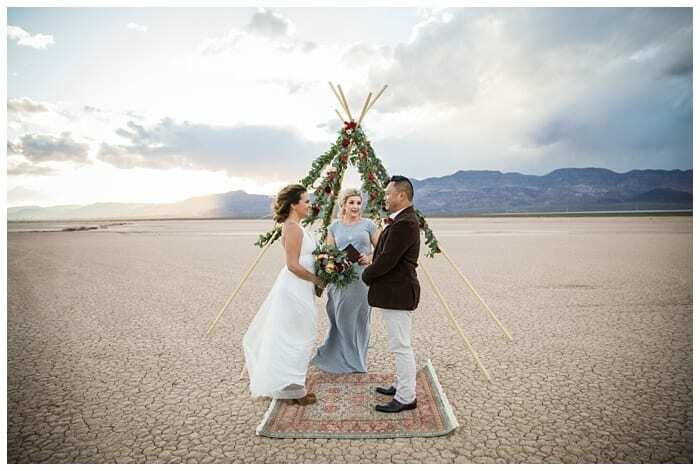 Our Las Vegas Officiant is experienced in marrying couples in stunning outdoor desert locations. For many, the ideal elopement journey should reach a pinnacle where rustic beauty and wonderful folklore come together. Eldorado Canyon is one of these amazing options in our Destination Elopement Packages. It’s filled with the pioneering spirit of the Wild West and the history of gold and silver mines. It’s only 45 minutes away from the strip. Eldorado Canyon offers vintage wedding photo opportunities with nearby Nelson’s Landing (Ghost Town). The eclectic area features old structures like barns, a general store and vehicles near cool-looking gas pumps set against the desert beauty and blue skies. Eloping in Vegas there allows couples to create their own wedded bliss.